This is a special online app that will enable you to perform a remarkable magic trick. Here's a sample version for you to practice with, after you read the instructions below. The magician asks a volunteer to pick a card from a deck of cards. The volunteer looks at the card, shows it to the audience, replaces the card in the deck, and shuffles the cards. The magician selects a card from the deck and shows it to the audience. "Is this your card?" the magician asks. "No!" the spectator says. The card the magician chose was wrong. "Merde!" the magician cries, momentarily lapsing into French, "I guess these tricks can't always work for me. Wait a minute, I have an idea... Let's see if the card shown on the magic screen is correct..."
The magician directs attention to the mystical LCD monitor, from the mysterious Dell. It has had a face-down card displayed on it the whole time. The magician then taps the card on the screen, and it turns over to reveal the spectator's card! Pick one which corresponds to the color of deck you wish to use, and the number of cards you wish to use. NOTE: These pages have a "lock" that will cause the card to flip to the same value for fifteen seconds after you perform the trick. This way, if the spectator quickly grabs the mouse and clicks on the card, it is "locked" to the same value. The sample version above does not have this lock - it is intended to be used for training yourself. The effect described above is just one of many. The magic is most effective if you don't have to ask the volunteer what her card was, which you can accomplish using various methods (such as a forced card). The important thing is that you, the magician, must know what the card actually is before you click on the card. The act of clicking the card with your mouse transmits that crucial piece of information so the computer can display the correct card. When you click on the card, you make contact on a particular spot on the card. After clicking the mouse button, you must move (or drag) just a tiny bit in one of eight directions before you release it. So what you are actually doing is a click-drag - but if you do it quickly and nonchalantly, it will appear to be a casual tap. The first bit of information is determined by where you initially place the mouse on the card, at the time you click it. 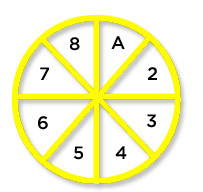 You choose one of eight boxes, as shown on the diagram to the right. The first two boxes on the left indicate hearts. The next two boxes indicate spades, and so on. The upper boxes indicate a low card, and the lower boxes indicate a card 8 or higher. Aces are considered low cards, and Jokers are considered high cards. You narrow down to a specific card by dragging your mouse a few pixels in a particular direction before releasing the mouse button. 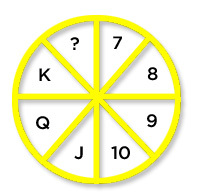 You drag in the direction of one of the eight pie wedges shown on the left. 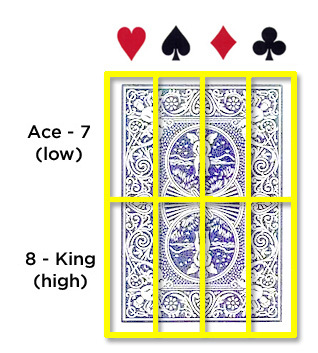 The first diagram shows the choices if you specified a low card, and the second diagram shows the choices if you specified a high card. 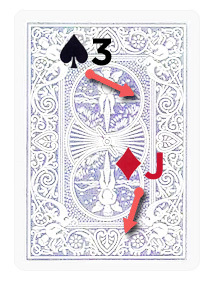 Note that for an Ace (or 7), you drag from the center, upwards, just to the right of the 12:00 mark. For a 2 (or 8), you drag just a bit above the 3:00 mark, and so on. So you can think of each of these wedges as being just to the side of one of the four cardinal directions. A click without a drag will produce a Joker. To make things a little clearer, the diagram on the right shows how to reveal two example cards, showing the clicks and drags you would make for each card. Try reproducing these on the practice application, at the top of this page. Again, these are the links to the different versions of the one-click card picker. Enjoy!